Summary: MARGINAL risk of severe weather today. Cooler temperatures for the rest of the week with slight rain chances. End of the week ends with more rain. For today, our high temp will be about 85 degrees under mostly cloudy skies and a 60% chance of rain and thunderstorms. Winds will be out of the south southwest at 5 to 15 mph with gusts up to 20 mph. Tonight, our temperatures fall to about 59 degrees and a 30% chance of rain and thunderstorms. Winds will be out of the west southwest at 5 to 10 mph. The Storm Prediction Center has decreased our outlook of severe weather today to MARGINAL. 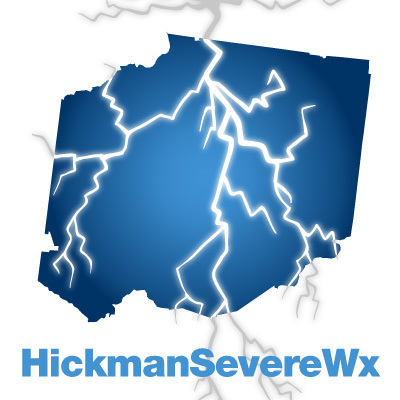 The SLIGHT category barely comes south of Hickman County. Our chance of seeing a tornado is 2% and chance of seeing wind damage or hail is 5%. The Storm Prediction Center will update this several times today (the above is already an update on one they issued overnight), so it could change and put us back in the SLIGHT category. 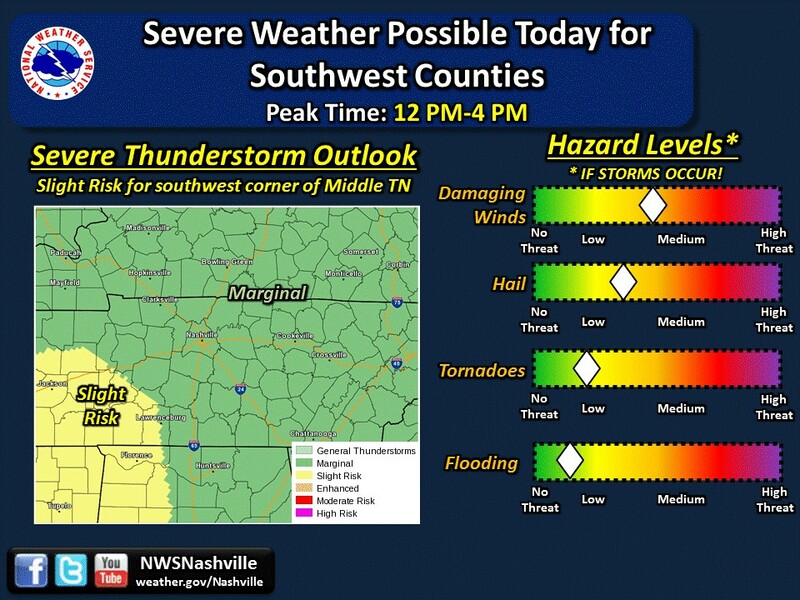 THERE IS A SLIGHT RISK OF SEVERE THUNDERSTORMS FOR MIDDLE TENNESSEE. POSSIBLE SEVERE WEATHER WILL BE FROM 2 PM THROUGH 10 PM. A cold front will be moving through setting the stage for showers and storms to develop along the line. The cold front is already visible by the showers and storms off to our west. 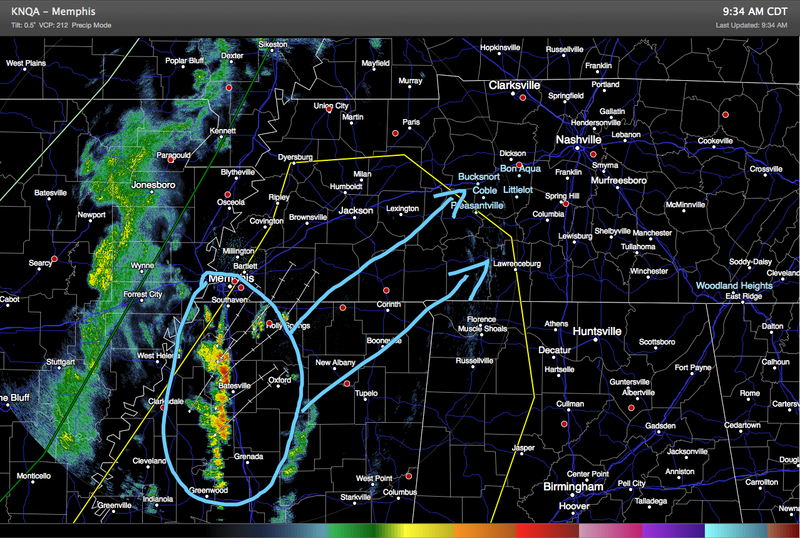 They are likely to stick together and form more of a line as it pushes through the MidState. 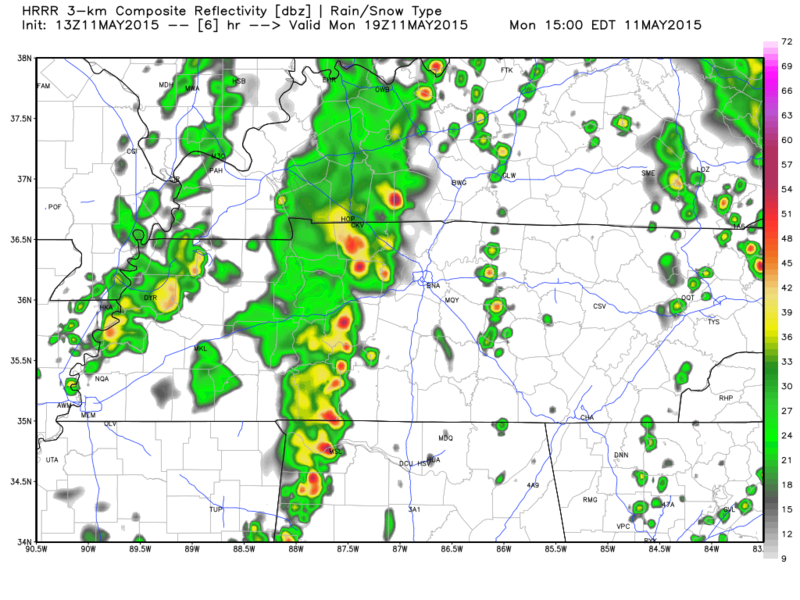 The HRRR model simulated radar is showing the line of storms could be here as early as 1pm. 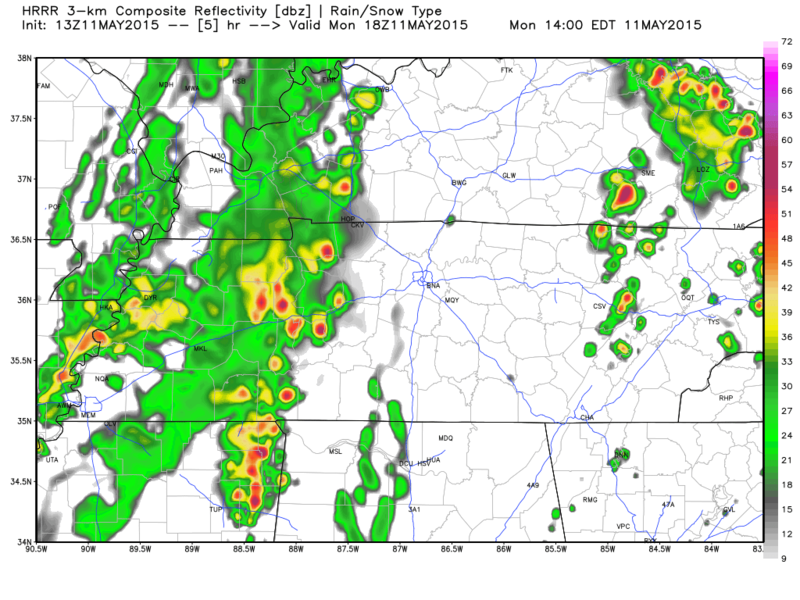 And the simulated radar for 2pm from HRRR. After the front moves through (this main line of storms), the HRRR shows our rain chances decreasing dramatically. The total amount of rainfall expected today looks to be about .10 to .20 inches of rain, so not a major soaker. So my thoughts on this potential for severe weather today? I think we may see a few of these storms strengthen enough to produce a warning or two, but it doesn’t appear that there is enough CAPE (convective available potential energy) to really get storms going today. So if storms develop, they could be severe, but they have to develop first to become anything of concern. No matter what happens, today is a good day to just keep an eye on the radar. We will be doing that for you and keeping you up to date on Twitter. Also, when warranted, we will update this post with more information should we need it. 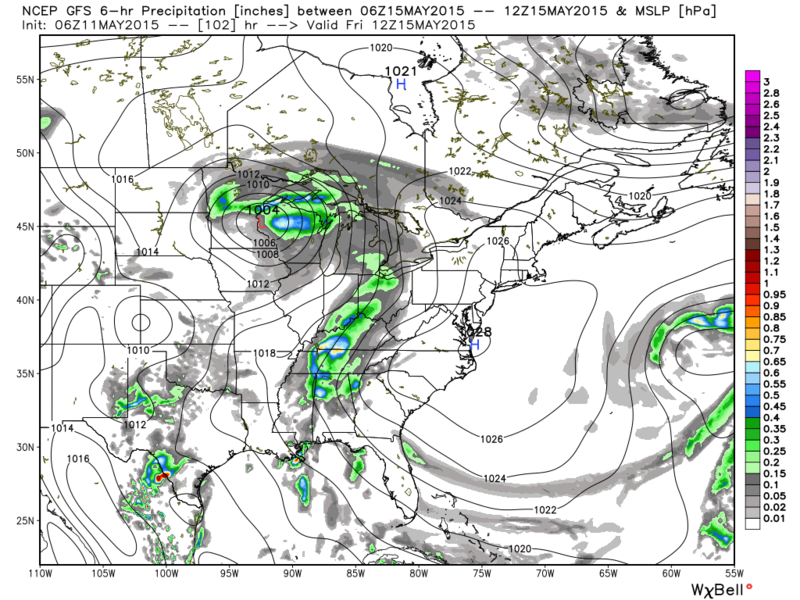 Mid-week looks cooler with a few rain chances. The cold front today will be bringing a bit cooler temperatures for most of the week. Tuesday brings sunny skies and a high temperature 10 degrees cooler than we’ve been experiencing to about 77 degrees. Winds will be out of the west northwest at 5 to 10 mph, making it feel just a tad cooler than 77 degrees. Tuesday’s overnight low will fall to about 51 degrees under partly cloudy skies. Wednesday will be a repeat of Tuesday with a high temperature about 78 degrees and mostly sunny skies. Wednesday’s low temp will be about 53 degrees under partly cloudy skies. Thursday rain chances creep back in at 20% chances of rain and thunderstorms and a high of 80 degrees. Rain chances increase Thursday night and into Friday as it appears another system will be coming through the Mid State then. We will watch this for the potential of severe weather. Here’s a way-too-early look at what could happen on Friday. 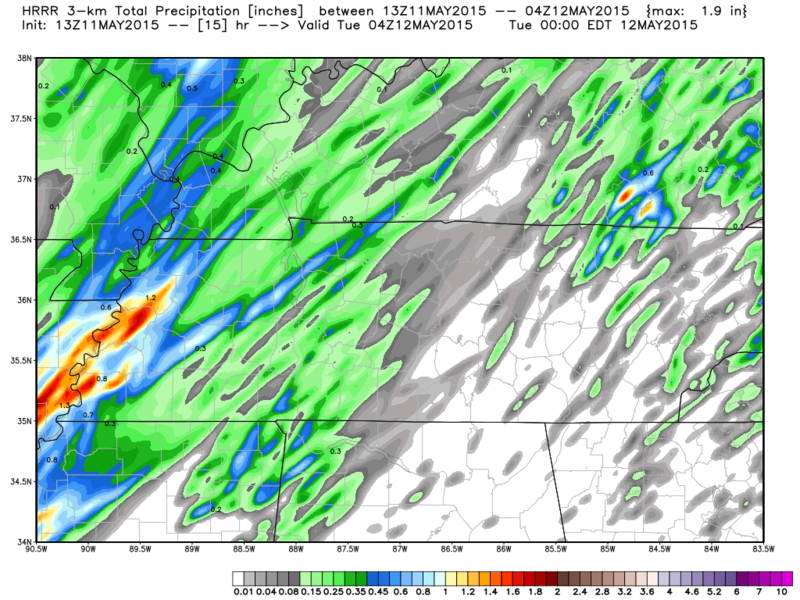 Here is the GFS precipitation model for Friday at 7am.